It just wouldn’t be Autumn in New England without a trip to your local pumpkin patch. Picking out the perfect gourds to adorn your dining table or front stoop is a treasured tradition for most families. But everyone’s favorite orange berry – yep, the pumpkin is actually a fruit from the berry family! – is good for more than just pies and Jack-O-Lanterns. These 5 New England pumpkin festivals celebrate every aspect of pumpkin mania! 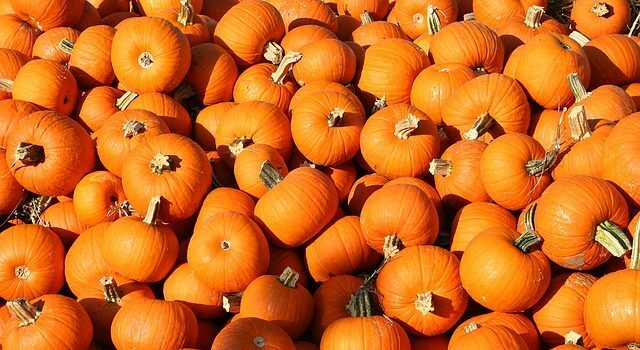 Festival events include a pumpkin parade, a pumpkin pie eating contest, and a weigh-in where some lucky pumpkin-grower will take home a $10,000 grand prize! The Pumpkinboat Regatta will take place on October 9 at 3 PM and features creative, colorful, hand-carved pumpkin “boats” manned by furiously paddling captains. For the grand finale, 600+ pound pumpkins will be hoisted 200 feet in the air, then released to plummet down onto a waiting stack of salvaged cars – it’s a heart-pounding, slimy mess! With a name like Pumpkintown, USA you know this place means business! Not only does your admission fee benefit the Sandy Peszynski Breast Cancer Foundation, but the entire festival is non-scary and kid-friendly. Pumpkintown Village consists of more than 70 pumpkin-headed people and animals in an old-fashioned village complete with a church, post office, saloon, and more. “The Ride” at Pumpkintown is a 20 minute hayride through the woods where more than 30 pumpkinheads can be spotted along the route. Don’t forget to pop into the Halloween Harvest Shop before you leave. You’ll find local handcrafted candles, pumpkin butter spreads, locally grown fresh produce, and beautiful fall plants. Picture this: A crisp fall evening, a hot cup of cocoa, and more than 5,000 beautifully hand-carved Jack-o-lanterns lighting up the night along the Roger Williams Park Zoo’s Wetlands Trail. The 2016 theme is “American Treasures” featuring commemorative postage stamp inspired carvings. Also on the trail will be scenes featuring Humanitarian Heroes, Endangered Species, Science Theater, and Backyard Garden. The Laughing Tree – a spooky favorite – will be returning this year, as well. Pony rides, hay rides, live music and a corn maze round out the festivities for this annual event, but the moment everyone looks forward to is the 3:00 pumpkin drop. Huge pumpkins full of candy are raised into the air with cranes – one set is for children 6 and under, the other for older kids. When they drop from the sky and smash down, R & C Farms becomes the world’s only candy-farm as the little ones scurry to fill their bags! This iconic event celebrated its 25th run last year with a change in venue from Keene, NH to Laconia. The festival holds the Guiness World Record for most Jack-o-lanterns in one place. Carved creations light up the sky as far as the eye can see with traditional faces and artistic renderings. The event is about nothing more than displaying incredible Jack-o-lanterns – you’ll find no fundraisers, no craft tables and no overpriced snacks – just lots and lots of incredibly carved pumpkins!